Reissue Bollywood movie poster of one of the biggest blockbusters in Bollywood, Hum Aapke Hain Koun..! (1994) for sale. Featured here for sale is a reissue Bollywood movie poster of the epic 1994 Hindi film which featured superstars Salman Khan and Madhuri Dixit in lead roles. Printed and circulated several years after the first release of the film (somewhere in the early 2000s), this Hum Aapke Hain Koun poster was designed for publicity of the recent re-release of the film but never ended up being used. 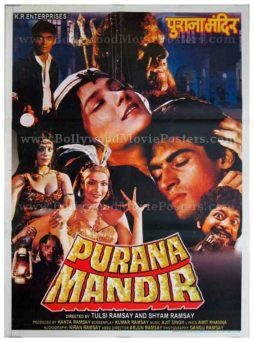 This old Bollywood movie poster features the unforgettable scene from the song, “Didi Tera Devar Deewana” where Salman Khan aims a catapult at Madhuri Dixit’s derriere. 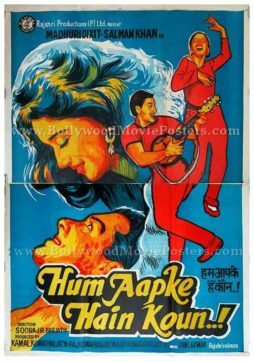 The title of the film appears in both English as well as Devanagari Hindi in this old Hum Aapke Hain Koun poster. Classic Bollywood movie poster of one of the biggest blockbusters in Bollywood, Hum Aapke Hain Koun..! (1994) for sale. 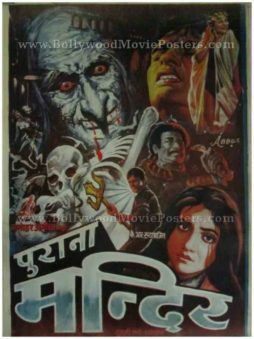 This is an actual surviving original Bollywood movie poster of the epic 1994 Hindi film which featured superstars Salman Khan and Madhuri Dixit in lead roles. Printed and circulated a few years after the first release of the film (somewhere in the late 1990s), this old Hum Aapke Hain Koun poster was designed for publicity of the film but never ended up being used.